This month we want to see some packing materials or any item that is not a "normal" scrappy item...ya know...like bubble wrap, packing tape, masking tape, band aid's, chop sticks ;) anything that is not a standard scrappy product. Yep that is band aid's. Anyone who knows me or follows my personal blog knows i LOVE LOVE LOVE anything skully...yay for me it is the "in" thing right now because i can find all kinds of stuff...before i had to really search. 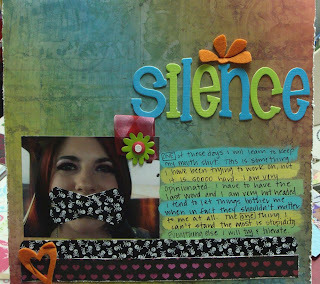 We can't wait to see your layouts..be creative..think outside the embellishment box :P be sure to link us so we can ooh and Ahh or slap ourselves on the forehead and say "why didn't i think of that". Dontcha hate when you have that moment? great LO's and ideas ladies! Here is mine... uses a shoe box and kitchen twine. LOVE these challenges. Love the out of the box thinking and the green thinking. 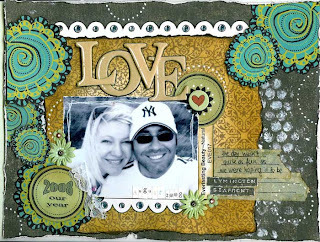 Heather put me on to this blogspot as I have made a card completely out of recycled products and thought my card matched your challenge criteria! Anyhow loved your ideas for left over letters and numbers (#8 idea was fab!). HI- I THINK ZIPPER AND OLD BROCH ARE REALLY NON SCRAPPY ITEMS ON MY LO AND I USED BINGO PACKAGING AS WELL(THE SMALL CARDS ARE PACKAGING) AND OLD WATCH FACE TOO.